Very spacious one bed apartment in a superb location within easy walking distance of the bustling village square and all amenities and close to the golden beach at Almyrida resort. A must see property furnished and maintained to a very high standard. This beautiful, comfortable apartment— one of a group of 4 — is situated in a quiet lane only a couple of minutes stroll from the cafes, tavernas and shops around the village square in Plaka. With private parking, small garden area and tiled terraces, there is plenty of room for relaxation and ‘al fresco’ sitting and dining. From the main entrance at the centre one enters the very spacious open-plan living and dining area with a good sized fully fitted kitchen area with cooker, fridge and washing machine. Patio doors lead to the large side terrace with steps through the garden area to the parking area and road. Here the new owners could create a small private garden and BBQ area plus storage area. 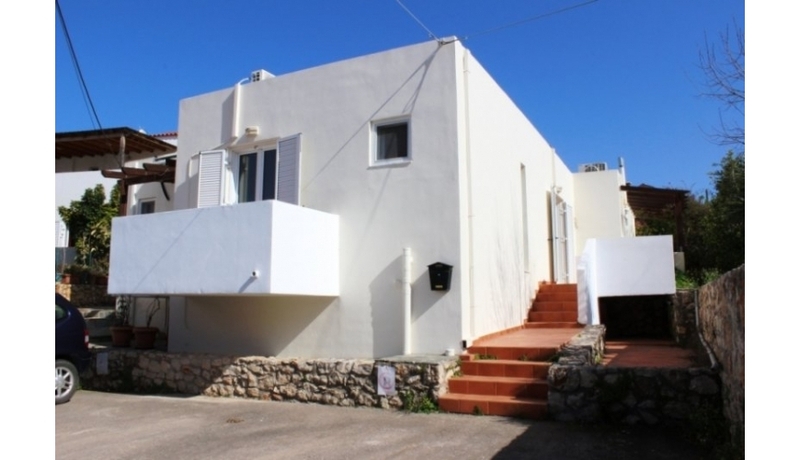 There is a good sized double bedroom with a further private terrace facing the sea and there is a fully tiled shower room with shower cubicle and toilet. There are aluminium doors, windows and shutters throughout providing lots of light and air to this lovely space. What does multiplying one by 2 result in?